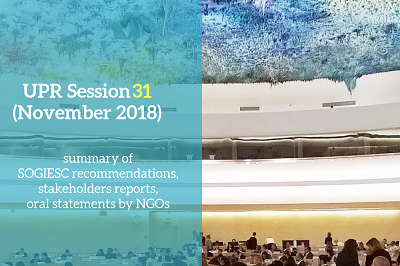 Click here to download a summary of SOGIESC recommendations delivered during the 31st session of the UPR working group. 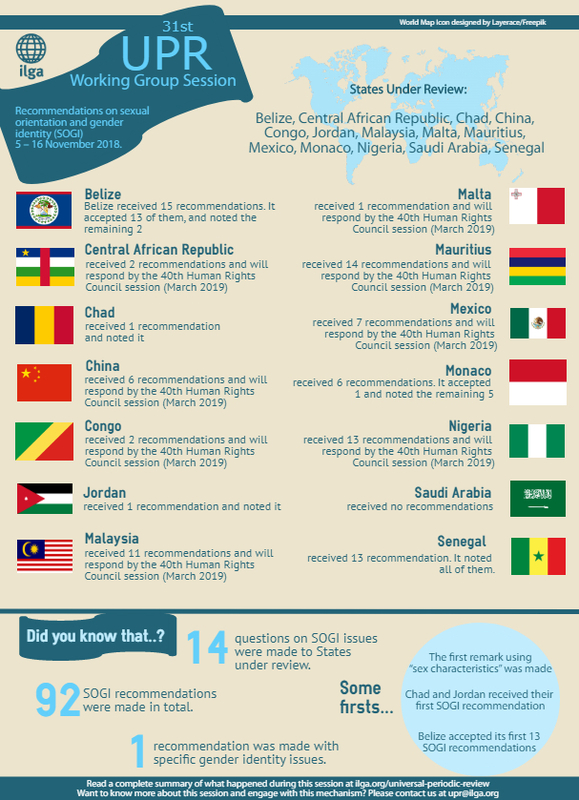 During the 31st UPR Working Group Sessions, Belize received 15 recommendations. It accepted 13 of them, and noted the remaining 2. During the 31st UPR Working Group Sessions, China received 6 recommendations and will respond by the 40th Human Rights Council session (March 2019). During the 31st UPR Working Group Sessions, Malaysia received 11 recommendations and will respond by the 40th Human Rights Council session (March 2019). During the 31st UPR Working Group Sessions, Mauritius received 14 recommendations and will respond by the 40th Human Rights Council session (March 2019). During the 31st UPR Working Group Sessions, Mexico received 7 recommendations and will respond by the 40th Human Rights Council session (March 2019). During the 31st UPR Working Group Sessions, Nigeria received 13 recommendations and will respond by the 40th Human Rights Council session (March 2019).